Fight, fight with all your might, no matter what gets in your way. 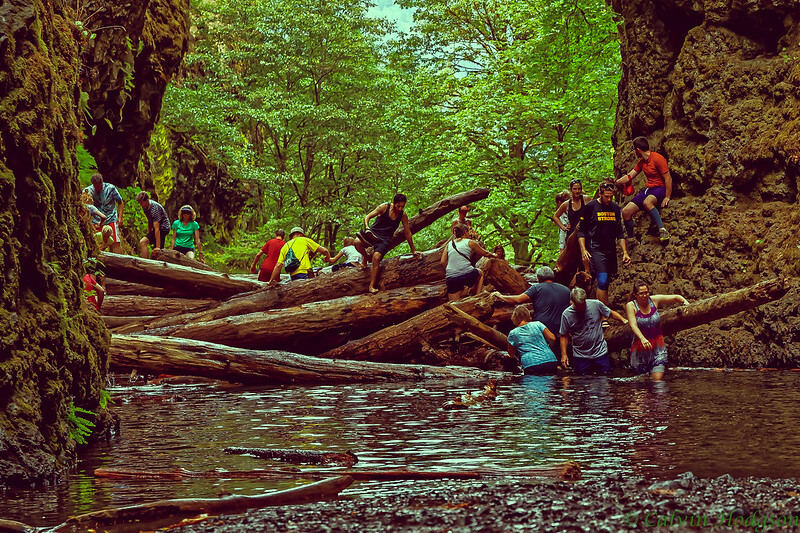 No doubt about it, Oneonta Gorge is a hike like no other. I had prepared for it by bringing along a waterproof phone case... and that is about it. Camera, camera bag, and tripod were all at the mercy of the elements as I dragged them along. The day is like any other day in Oregon on a summer day; mildly warm, not too hot. The sun is out and the trees are blowing. 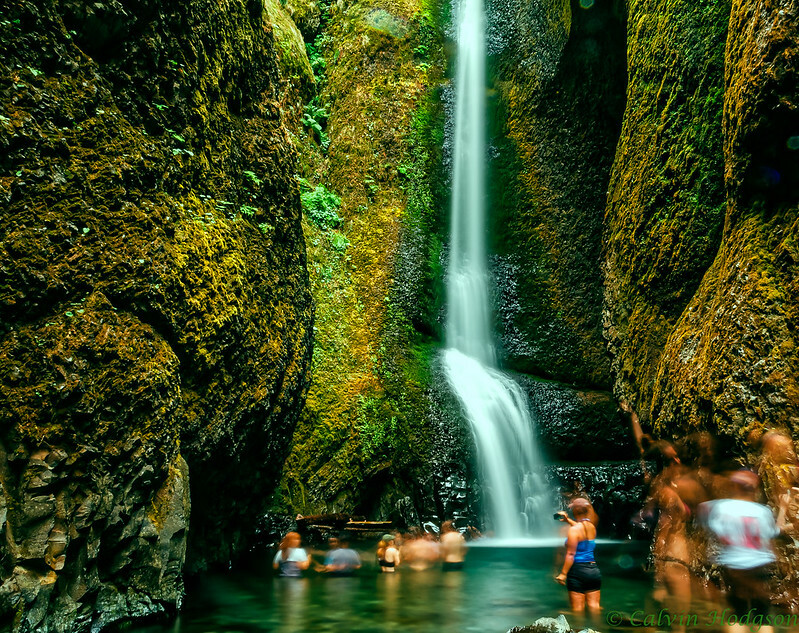 Oneonta Gorge is magnificent yet crowded. Upon first arrival, there are lines of cars parked on all sides of the road. We are lucky to find a spot that is not too far from the start of our "trail". 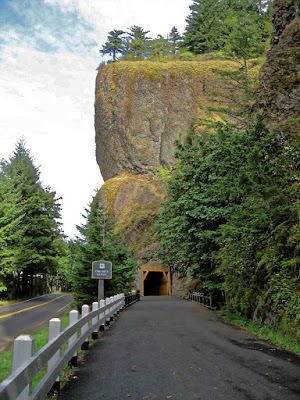 After a not so long walk along the side of the road, we walk comes across the Oneonta Tunnel. This tunnel was at one point used by automobile traffic driving along the historic highway. The highway now runs on the outside of this tunnel. Foot traffic goes through this tunnel now. From this vantage, I can see down through rows of shimmering green trees and sparkling water below. While there is one official way down via stairs, I decide upon walking down a fallen tree. Its massive trunk required jumping down. Untitled by Doug Kerr CC by SA 2.0. Minor tone curve adjustments made. Our main concern now is how crowded it will be. We have heard that lines often form when going over the logjam not too far from the bridge. Yet, it is more of a conglomerate of loads of people climbing this why and that. On this day, a guy with a lasso is filming a commercial for some business. He seems very enthusiastic about it. He was on logs that were harder to climb over on the right-hand side. It is rather slow to move through this logjam. Like the end of the day rush hour traffic. After making it towards the end of the logjam, there is waist high water that must be waded through, no going around it. It is smooth sailing from that point on. The fun begins yet again when we come upon chest high water. With a camera bag on one shoulder and a tripod the other, it seems as though I'll have to lug them over my head. 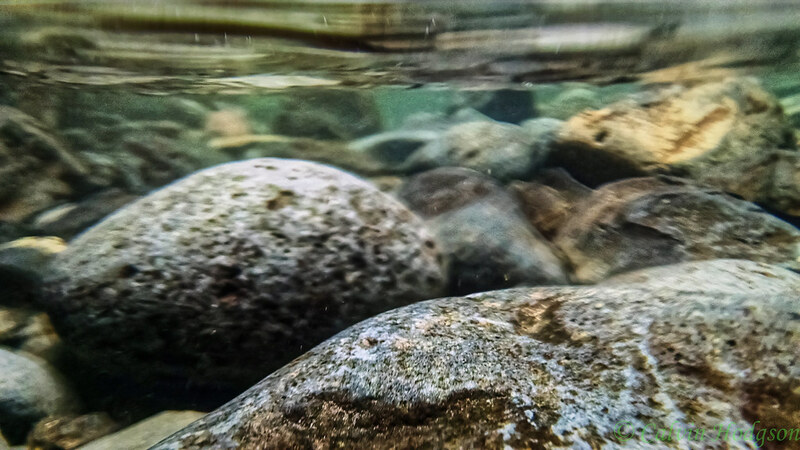 Nonetheless, I press on as the sound of the ffalls entices me to push through the water. With each step, my feet drag slower as the water resists my movement forward. My footing seems stable enough to not worry greatly about tipping over like a lady running on heels. The end is near, a few more steps and I will be free at last from the grip of the river. It lets go of me. Now I trudge along the rock banks towards the end. There it is, you cannot help but to look up at its glory when you first see it. People, of course, are flocked here like zebra and lions are to a watering hole. With such beauty, I can tell why. Lots of people are moseying around snapping pictures which will inevitably end up on Facebook and Instagram. (Selfie anyone?) Not surprisingly, no selfie sticks around. Obnoxious things (I happen to own one). After some time, it is time to leave. If only I had brought a table. I could have waited to be served for dinner (that was actually a book signing). The way back seems quicker than actually going towards the falls. The logjam is once again the exception. It is slow going as faces and groins collide (not really lol). The rodeo man was gone, he was the highlight of the slow waddle through the logs. That's it, the end of this adventure. Back on the highway west to our eagerly awaiting home.